Lovely guest cabin on Six Mile Creek. Minutes from unbelievable fly fishing on mountain streams, spring creeks, and the Yellowstone River. Cabin has a Smart TV and Internet. Two bedrooms and one bath in the cabin, with an incredible backyard and stunning mountain views. Brief Description: The Emigrant Guesthouse sleeps four guests comfortably in two bedrooms in the famed Paradise Valley. Located on Six Mile Creek, with incredible views of the rugged Absaroka Mountain Range this property wows its guests with endless wildlife and bird viewing opportunities, in addition to easy access to hiking trails, fishing and Yellowstone National Park. General location: Twenty minutes south of Livingston, near Pray, Montana. Yellowstone National Park is only 30 miles away! The Emigrant Guesthouse is located on a shared property with an additional single family home that is occupied year-round. Style and decor: The Emigrant Guesthouse seamlessly blends a rustic cabin with all of the comforts you expect in a modern home. 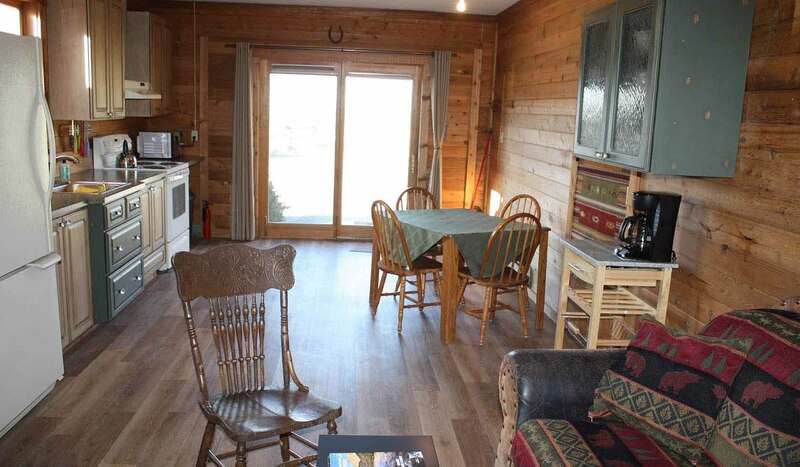 Recently renovated, the cabin includes comfortable furnishings and tasteful decor throughout. Size of the home: The cabin is approximately 800 square feet. Bedrooms/bathrooms: There are two bedrooms at the Emigrant Guesthouse. As you step down into the master bedroom, you are greeted with a comfortable queen size bed. A window seat is a perfect place to take in the great views! The second bedroom has two twin beds. Both bedrooms have access to the full bathroom, which was recently remodeled and includes a walk-in shower and a large closet. Kitchen: The kitchen, dining and living areas of the cabin are all one big room, which gives the cabin a very homey feel. The kitchen is equipped with an electric range and oven, refrigerator, microwave, and all the necessary cookware needed. The kitchen table seats four comfortably and a BBQ grill will be provided for outdoor meals. Living room: The living room adjoins the kitchen and dining area. Comfortable furniture is provided, along with a Smart TV and Internet. Your Netflix, Hulu and Amazon Prime accounts can be accessed on the TV for television programming. Activities nearby: Enjoy fine hiking, mountain biking, fishing, horseback riding, whitewater rafting and all that the Paradise Valley has to offer. A day trip to Yellowstone National Park is a definite must, so check out our sister company Greater Yellowstone Guides for a terrific private tour of the park. Just a short drive away is Daley Lake - fun for fishing, swimming and a hot spot for local windsurfers, as well as Chico Hot Springs. And, if you don't want to get in the car, you can take a day hike right out the back door of the cabins. There's so much to do! Distance to nearest airport: The Gallatin Field airport, located just outside of Bozeman, is approximately an hour away.